Ah, the Mediterranean. Few words can so easily conjure up sun, sea, and sublime southern European cities and towns. The region ranks as one of the hottest destinations for cruise lines and their passengers, and with all the attractions on land, its easy to see why the Med makes for easy southern Europe sailing. And from a vacation-planing standpoint, a Med cruise has a lot of bang for the buck, too: generally all-inclusive pricing (and generally less-expensive options than a similar land-based vacation); unpacking once instead of multiple times in different cities; widely varied countries and ports of call; and fewer language issues for most of the trip. With almost a million square miles of water at an average depth of about 5,000 feet, the Mediterranian coastal region offers lots of room for cruise ships. Ports are plentiful, too, in the 2,400 miles from the far eastern part of the region--which can include a call on the Canary Islands--to the far western Med, which can include calls in Turkey, Greece, Egypt, and more. Centrally located Italy is often an embarkation and debarkation point; it also offers easy access to many popular pre- and post-cruise possibilities on the countrys coast and inland. Roman port Civitavecchia is perfect for a pre- or post-cruise Roman holiday, and Venice, another popular embarkation point, is a wonderful port of call. Other Italian stops include Savona, Livorno (the gateway to Florence, Pisa, and more), Genoa, Naples, Taormina, Sorrento, Portofino, Malta, Sicily, Elba, Capri, Sardinia, and several others. To the west, France and Spain offer their own allure. In France, Nice, Monte Carlo, Cannes, St.-Tropez, Villefranche and Marseilles are filled with that coveted French je ne sais quoi, offering wonderful beaches, cuisine and culture. In Spain, magical Barcelona and more await. Palma, Mallorca, and Ibiza are popular ports in the Balearic Islands, while Malaga in the south provides an Andalusian option (and access to Morocco and even Spains Ceuta in northern Africa). North Africas Tunisia and other lesser-known ports are also accessible on a western Med cruise. To the east of Italy, several coastal ports in the Adriatic Sea are now on the radars of cruise lines, including Dubrovnik and Split in Croatia. Both (and other nearby ports) feature interesting history and culture without the crowds sometimes found in more popular southern European ports. Greece continues to lure cruise lines and their passengers with ancient history and modern friendliness on the mainland and its many islands. From Athens to a wide range of island ports such as Corfu, Crete, Rhodes, Santorini, Mykonos, and more, a Grecian odyssey by ship is the Med in miniature. Further east, Istanbul and the coast of Turkey continue to grow in interest. Istanbul is where the West meets the East right in the bustling port, while the beaches and history of southern Turkey easily greet those arriving by smaller ships. Those on longer cruises may head even farther afield. The far-eastern Med means access to the treasures of Egypt, Israel, the Suez Canal, and more, allowing those with more time even more meandering. There are more options in the Mediterranean than ever; and its just a matter of choosing the cruise line to best suit one's personality and travel interests. In response to demand, and thanks to a loyal following with kids and kids at heart, Disney Cruise Line is returning to Europe. Departing out of Barcelona, Disney Magic will sail four 10-night and four 11-night cruises in the region in April, May, August, and September (the ship will move to northern Europe mid-summer), with varied ports and distinctly Disney port adventures for families and couples without little ones, too. Celebrity Cruises is redeploying Celebrity Century from Miami to Europe for the 2010 spring-to-fall cruising season. The ship will sail 12-night Med itineraries out of Barcelona to a wide variety of ports in France, Italy, Turkey, Greece, and Croatia. This is in addition to Celebritys Solstice-class ships and itineraries in the region. Newly named sister line Azamara Club Cruises will also be in the Med with fresh onboard experiences; late-night and overnight stays; and unique shore excursions, such as driving a Ferrari in Italy. Princess Cruises is also offering unprecedented variety in the Med. Highlights include: the return of Ruby Princess to cruise the lines Grand Mediterranean and Greek Isles routes; widely varied cruise lengths and voyages aboard Crown Princess, Star Princess, and Grand Princess; intimate Med exploration aboard Ocean Princess and Pacific Princess; shorter seven-day itineraries; new ports; two-day onshore experiences. Royal Caribbean is also active in the Mediterranean. Highlights of the lines Nation of Why Not 2010 Med season include: four- and five-night voyages from Barcelona; five- and seven-night sailings out of Malaga; seven- and 12-night itineraries out of Civitavecchia; 12-night Holy Land voyages from Venice (as well as seven-night Greek Isles options); 14-night alternating eastern and western Med cruises from Southampton, England, as well as 10- and 11-night Canary Islands voyages; and three- to five-night escorted land tours in destinations including Madrid, Barcelona, Venice, Florence, Italian lakes and more. 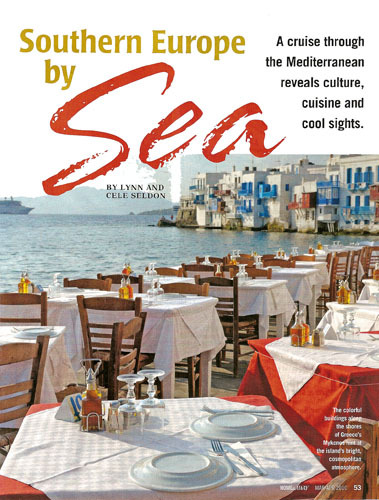 Holland America Lines Med season includes a new ship, many maiden calls, more roundtrip departures, and overnight stays on both long and short sailings. Debuting July 4tand sailing out of Venice and Barcelona, the Nieuw Amsterdam will feature a variety of Mediterranean sailings, visiting ports throughout Italy, Greece, Croatia, and Turkey. Upscale Cunard sends the Queen Victoria between Venice and Rome or Barcelona. Because these cruises begin and end in different Med cities (rather than roundtrip from the ships homeport in England), theres more time for exploration--including select overnights in Venice, Barcelona, and Istanbul. For more information on Mediterranean cruises available and for trip-planning assistance to get on your way, contact a locall AAA Travel agent or visit AAA.com/travel.